There are many reasons for kids to become involved in the martial arts. We have developed a program based on traditional Taekwondo for kids called Karate for Kids. The Karate for Kids system is based on a lifetime learning concept in addition to technical skills. The programs develops self-confidence, as a student's self-confidence increases, their performance in other activities improve. Students learn the most effective method of self-defense that will give children the confidence to defend themselves in all situations. Being a karate kid means being a better person. They learn skills such as: following directions, paying attention, working and helping others. Martial arts training improves overall physical fitness. It provides the attributes necessary to excel in all aspects of life. In Taekwondo, every child is a winner because they train at their own ability level and are not compared to others. They are encouraged to reach their own potential. 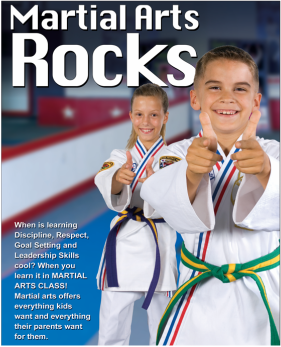 Karate Kids earn stars as they demonstrate monthly themes such as: courtesy, respect and discipline. They also earn stars for school report cards and special awards.